Location: Famous House Hotel is located in the centre of the city, in very close proximity to the old part of Plovdiv, where the museums, the Roman Stadium and the Amphitheatre are situated. 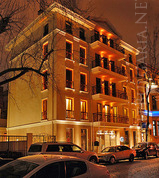 The hotel is also close to the International Plovdiv Fair and to the main shopping street. Accommodation: Famous House Hotel offers 20 comfortably furnished rooms and two VIP apartments, equipped with central air conditioning, LCD TV, direct telephone line, safe, mini bar, Internet connection. Wine & Dine: The lobby bar of Famous House works 24 hours non-stop and offers a nice summer garden during the summer. At guests' disposal is a cosy restaurant, disposing of 60 seating places. The restaurant serves Bulgarian and European cuisine, prepared by the best chefs of Plovdiv. Famous House restaurant is an excellent place for cocktails, wedding parties, official business lunches and dinners. Business Facilities: The conference hall has a 50-places seating capacity and is appropriate for the conducting of seminars, conferences and presentations. The hall is fully air-conditioned and equipped with flipchart, screen, multimedia. Coffee breaks and work cocktails organized upon request.